85% of financial success depends on the personality of a person. The elements of good personality are good communication and social skills. Making Champs, a venture by an IIM alumni, is offering a Personality Development program for children in the age group of 6 yrs and above in Navi Mumbai. The focus of the program would be on Public Speaking and Social Smartness. The program is learning with fun through a story. It includes classroom activities with concept videos, student videos, exercises, lot of examples and games. 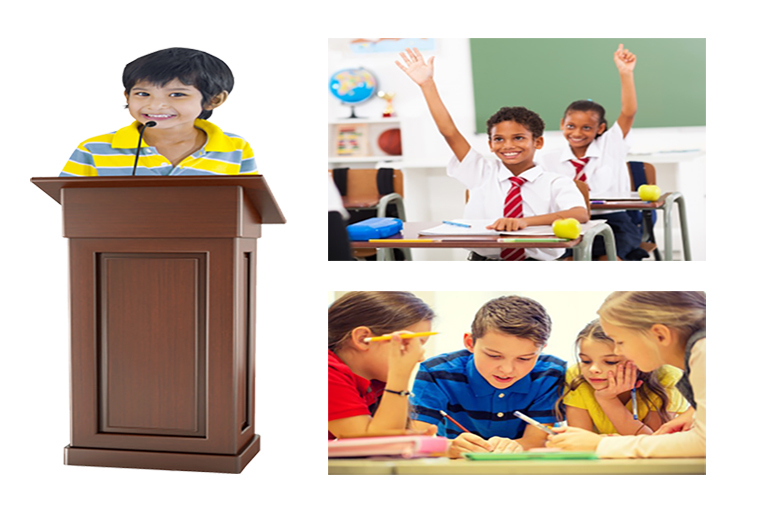 Every student is made to participate in the speaking exercises, team activities, role plays and games. Students are also made to assess the speakers which provide a distinguished learning experience. 1) Improvement in Public Speaking – Improvising content, effective delivery, techniques for preparation and practice. 2) Proper introduction on meeting new people and ability to have smart conversation. 3) Better performance in school–answer the questions asked by the teacher, speak on a topic, asking doubt in the class, etc. 4) Improved performance in competitions- elocution, recitation, etc. 5) Confident performance (anything like dance, sing, speak, recite) on stage. Videos of speeches are shared with students and parents so that they know how the speech is and they also learn the skill of self-review. The classes are held once a week for 90 minutes on a Sunday. For More Details: Call 9870116557 and visit www.makingchamps.co.in. 1. How many students will be there in one class? Ans: Around 8 to 12 students in one batch. 2. Will all the children get to participate in the activities? Ans: Yes, we make every child participate in the activities. Apart from this, every child has to speak at in front of audience (including parents). 3. Will we get any written material for future reference? Ans: A complete self-help book is given to the children in which all the concepts are explained. The book also contains links for the learning videos which make the learning interesting and simple for the children. 4. How my child will be different after attending this program? What difference will it make to my child? Ans: This program will help the child in increasing his/her self- confidence. The child understands the dos and donts of presenting himself/ herself which leaves a positive impression on the people with whom they interact. As on June 2017, 5 of our students are part of elected student councils (Head Boy/Girl / Captain / Vice Captain / Prefect etc across schools like North Point, St Mary’s ICSE, Avalon Heights etc. In general, all our students have shown improvements. Watch this video: Why Learn Public Speaking? 5. My child is already very bold and forthcoming? Will this program be useful for her? Ans: It’s a good thing that your child is bold and forthcoming. This program will give the right inputs which will make him/her perform this art perfectly and stand out in the crowd. 6. Will there be any follow-up sessions? Ans: No. It’s a standalone program. A book is given for revising the concept and practicing. Making Champs has a channel on youtube. On this channel, there are number of videos available. You can subscribe this channel to improve your Public Speaking skills further. 7. What else the students are required to do to improve their Public Speaking and Social skills? Ans: Nothing can replace practice. Students have to speak to group and practice public speaking whenever they get opportunity. 8. Will this program have any effect on the performance of the child in School? Ans: Yes definitely. The child will become more assertive, vocal and participative in the school. His/ her performance in elocution, interaction with teacher and peers will improve.